There are over 700 cheeses produced in Britain! Soft and hard cheese, blue cheese and goat’s cheese… what are the differences? And which wine are they best served with? This type of cheese does not undergo any heating or pressing. A penicillium fungus gives it its furry white rind. Not usually used in cooking, soft cheeses are used to spread on bread or crackers. Which wine to serve with them? Young wines such as Bordeaux or Beaujolais. This type of cheese does not undergo any heating or pressing. The rind is rinsed and brushed with a solution of salted water enriched with specific bacteria, which encourages orange-coloured fungi to appear. Ideal for snacking or desserts, some semi-soft cheeses may be used for cooking if they stand up to heat well enough. Which wine to serve with them? White Côtes du Rhône or red Bordeaux. Once transformed into curds, these types of cheese are heated, pressed, moulded and left to ferment. This is how the famous holes appear in cheese that is stored in cellars (such as Emmental). They are very rich in calcium. Maturing can take from three to nine months, or even longer. Which wine to serve with them? White Burgundy and Chardonnay, or full-bodied red wines such as Rioja. A hard cheese needs to have less water content (30-48%) in the end product than a soft cheese (which has 50-70%). Packed into moulds, firmly pressed and stored for long periods (up to two years), they become hard and more pungent over time. Which wine to serve with them? Red wine such as Burgundy. The production of this cheese involves inoculating it with fine, long skewers containing penicillium cultures which allow mould to develop in the cheese. This is what produces the green or blue veins. Which wine to serve with them? Sweet wines. Loupiac, Sauternes or port work well. 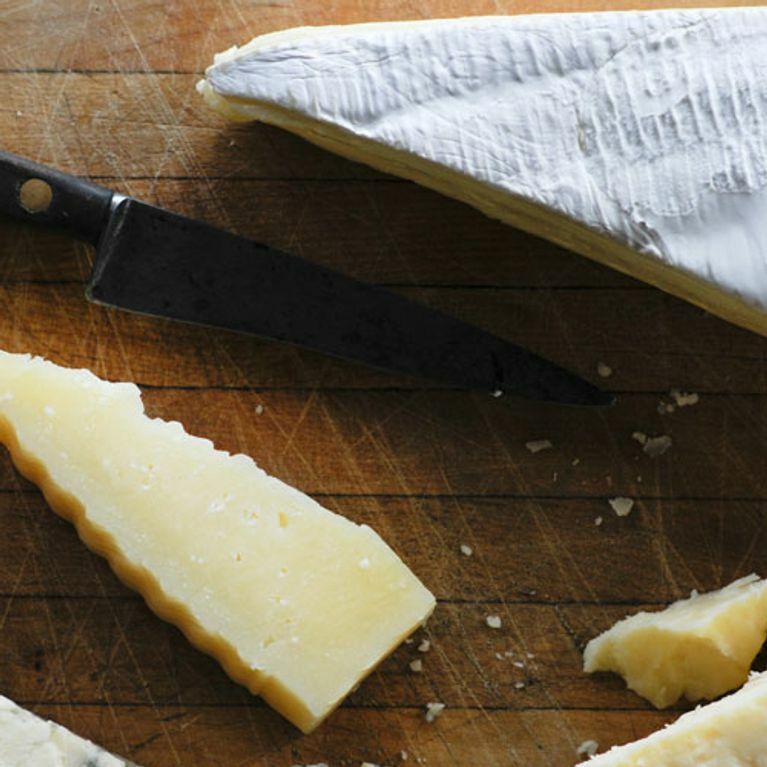 This cheese isn’t distinguished by its method of production: it is just made with goat's milk. Goat’s cheese has a large range of flavours and textures, from dry and hard to soft and creamy. It is sometimes covered with charcoal or rolled over herbs. Which wine to serve with them? French Sauvignon Blanc, Pouilly or Chablis. The cheese is made up of a mixture of cheese(s), butter, cream and milk that is heated and emulsified. Some varieties are flavoured or spiced. The shelf-life is generally very long. This is fresh cheese with 80% water content. Milk is curdled and drained, but little other processing takes place and there is no ageing. Cottage cheese is typically eaten with fruit or in salads. This cheese is obtained through kneading and stretching the curd until it reaches the desired consistency. Mozzarella is often used in pizza and lasagne. This cheese is hardly drained or matured; its milk proteins simply coagulate under the effect of lactic ferments. It can be eaten on its own or with added flavouring. - The amount of fat marked on the packaging is calculated for the dry weight, so a 100g block of cheese with 50% fat doesn’t actually contain 50g fat. If it’s made up of 50% water, it will weigh 50g dry and contain 25g fat. - Generally speaking, cheeses with a high water content (in other words, the softer ones) are lower in fat. - There are low-fat versions of many cheeses available. However, fat is important for the cheese’s texture and taste, so low-fat ones can taste a bit bland.